Combination Press Projection Welders - Spot Weld, Inc.
Press Spot / Projection welders use the same round arm design as the Press Spot welders, but have a lower knee like the projection welders. This gives you the versatility of a Press Spot, and the simple setup of a Projection welder. Combination Press Spot / Projection welders differ from Rocker Arm welders in that the upper ram comes down in a linear fashion. With a Rocker Arm style welder, the welding electrodes effectively rotate into place. A Press Spot is ideally suited for fasteners and studs, because of this linearly descending action. 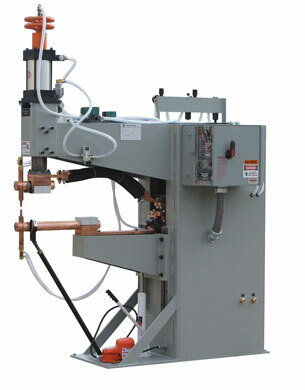 Spot Weld, Inc. offers two sizes of press spot welders, to optimize size and expense. The CPP is our full size model press, RWMA size “2”.